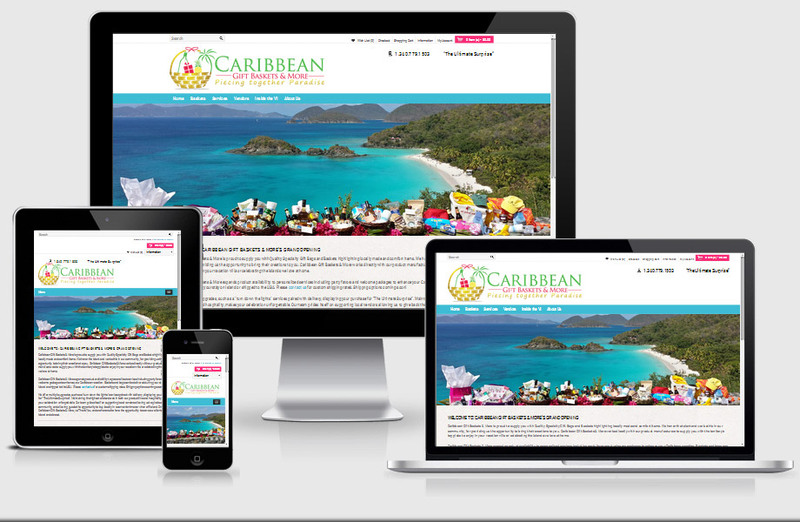 We currently maintain approximately 130 websites - you will find some examples of sites we have developed below, each of which may be visited by clicking (sites will open in a new window). 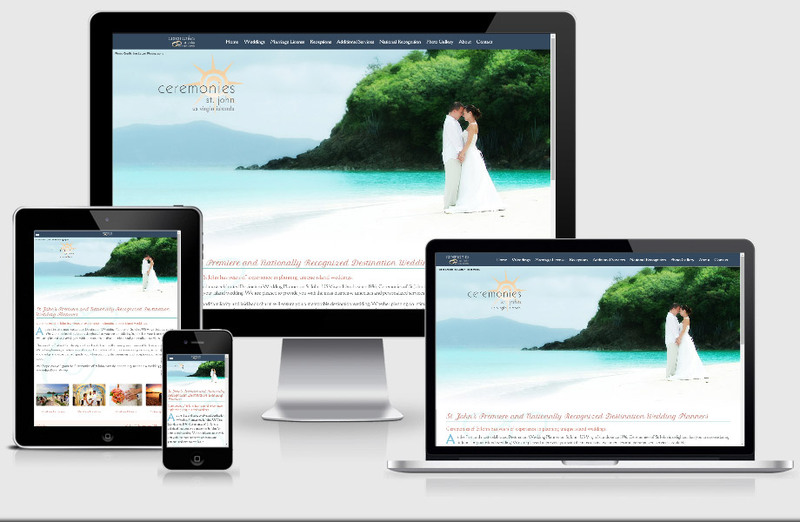 Stacy Mulcare of Ceremonies of St. John is the first professional destination wedding planning company located directly on the Caribbean Island of St. John in the US Virgin Islands. 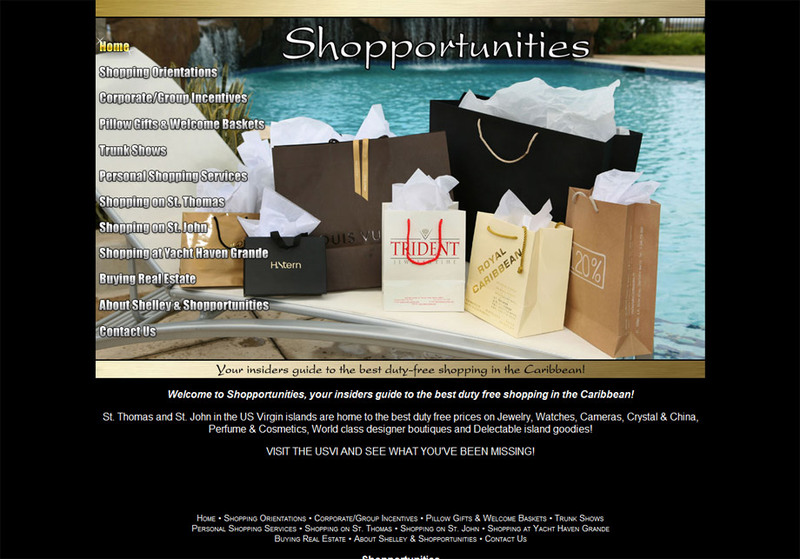 Online shopping cart and site for a gift basket delivery service on St. John & St. Thomas. Susan at Passion Flower is St. John's premier destination wedding florist, exclusively designing unique wedding bouquets and flowers for your St. John wedding. 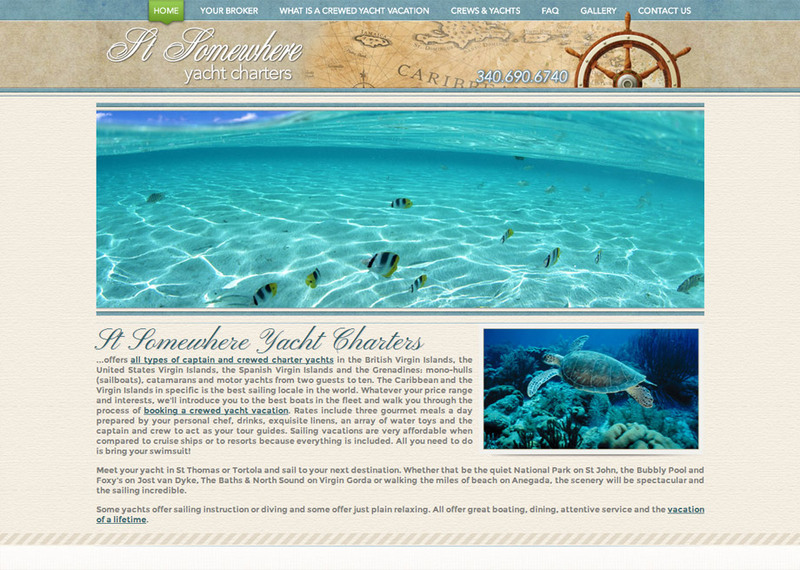 Yacht charter brokerage for the British Virgin Islands, the United States Virgin Islands, the Spanish Virgin Islands and the Grenadines. 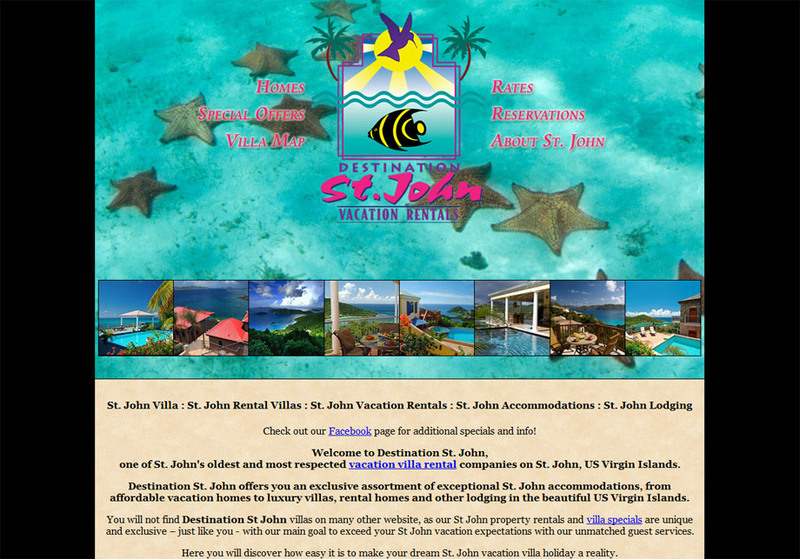 One of St. John's preier destination management companies, which includes a tool that allows them to post their own rate updates and pricing list. 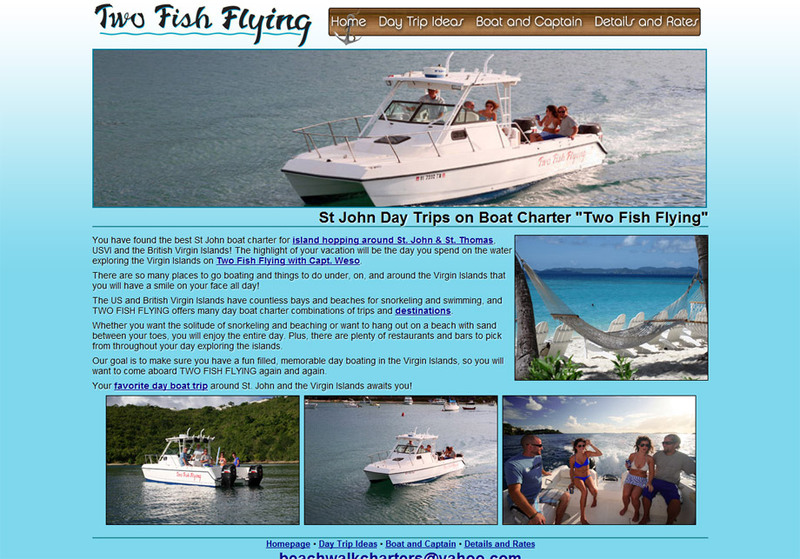 Day trip boat charter company offering trips to the various US Virgin Islands & British Virgin Islands. 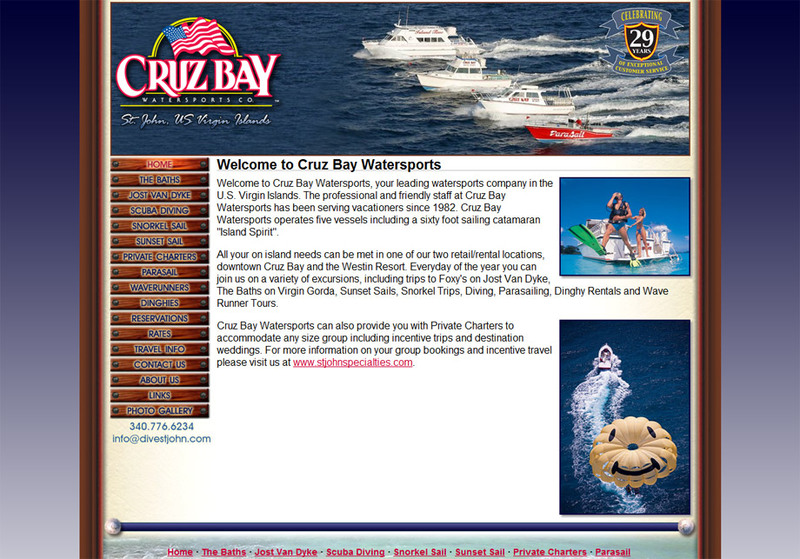 Created for Cruz Bay Watersports, one of St. John's most popular watersports companies. 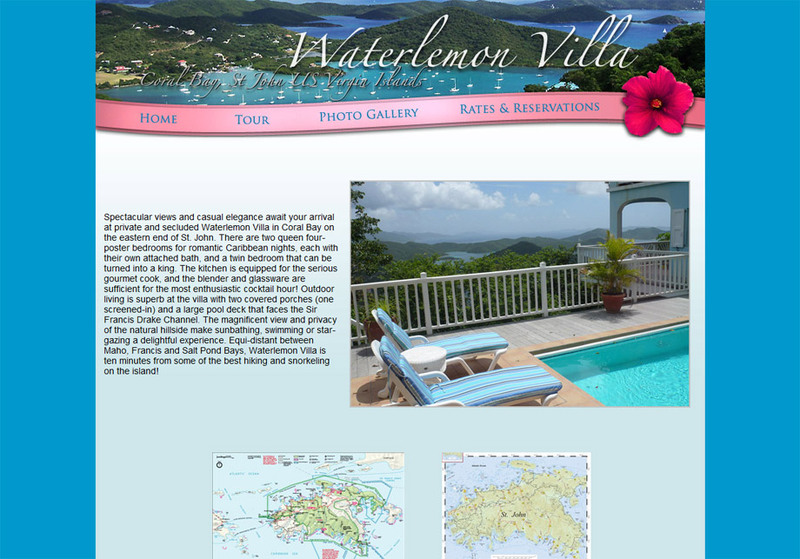 Another villa management and booking company which handles dozens of rental villas on St. John. This site uses its own custom database system as well as a full administration system to allow for them to add/revise listings and manage specials at any time. 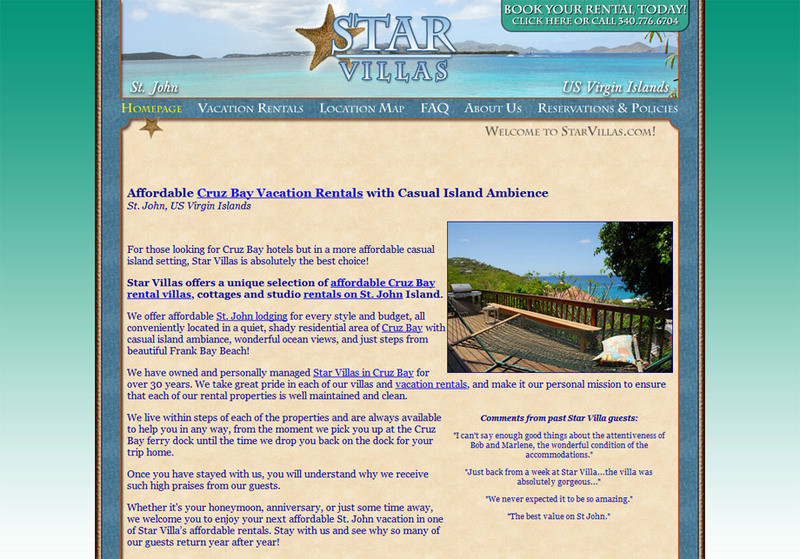 In addition, we also built a custom availability calendar system for all of their properties, which is tied in with the villa administration system. 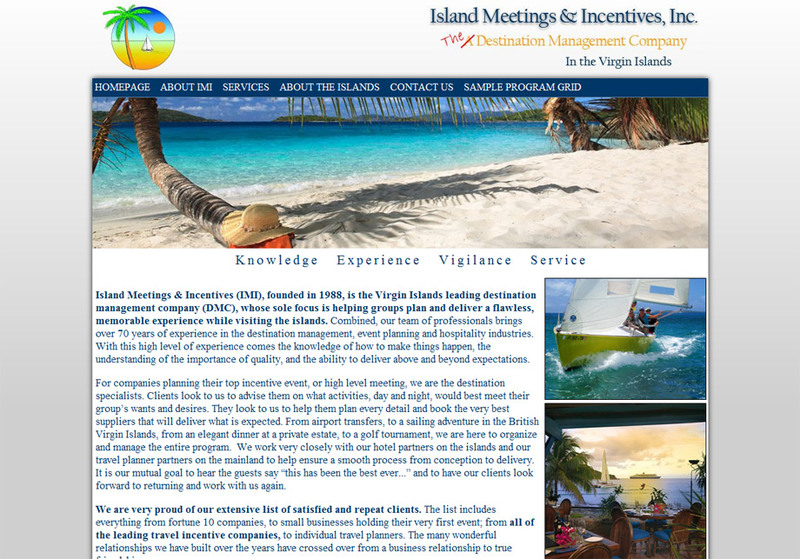 Island Meetings & Incentives (IMI), founded in 1988, is the Virgin Islands' leading destination management company. 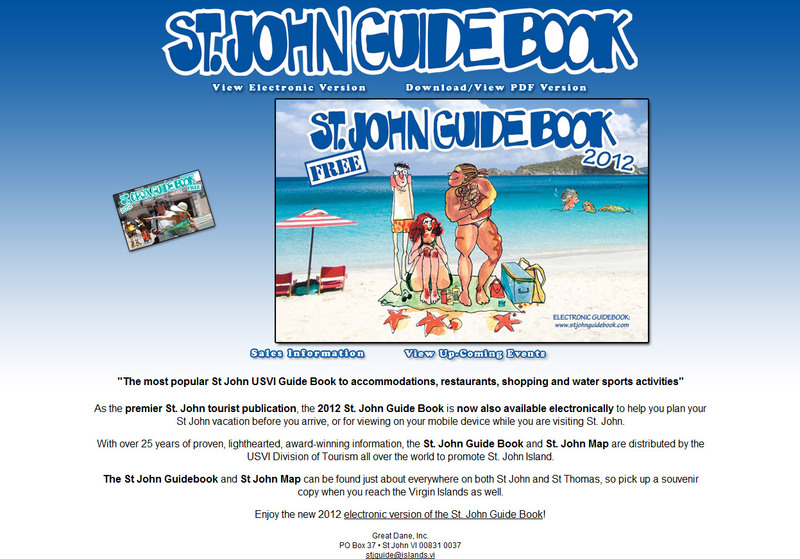 Web site and electronic version of the ever-popular St. John Guidebook, which is published annually. 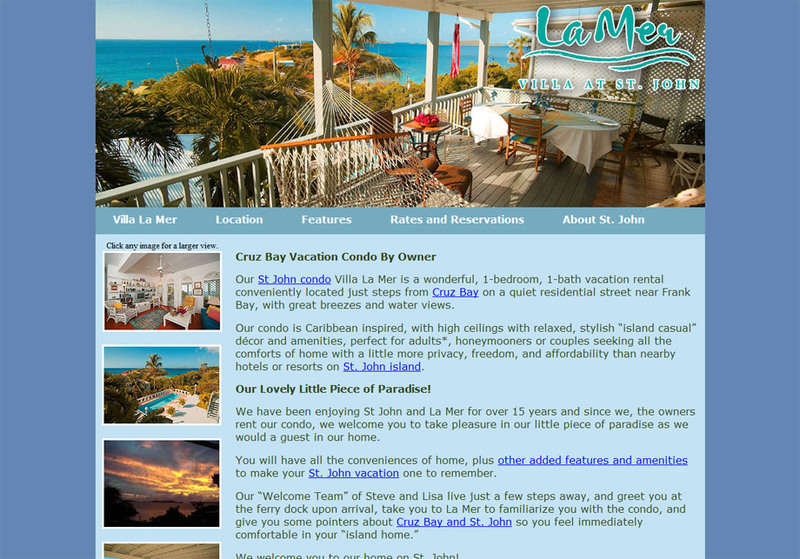 Small website for a Cruz Bay vacation rental. 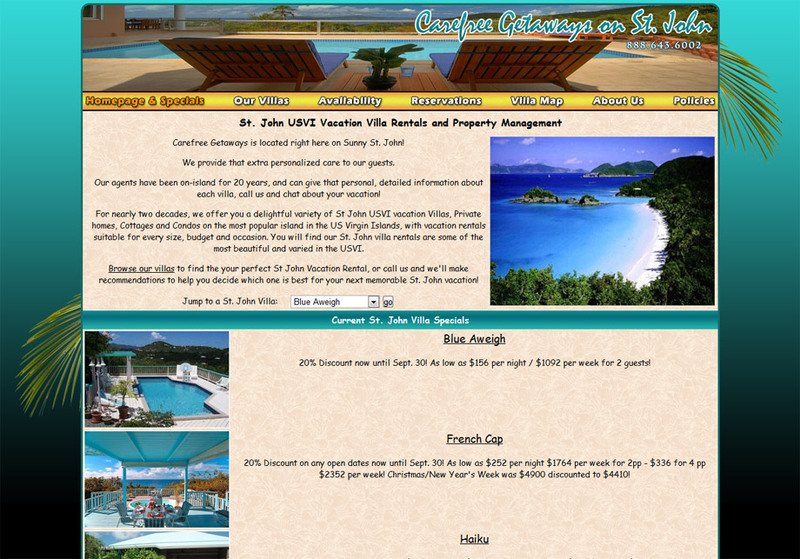 St. John villa management company site which utilizes a custom database. 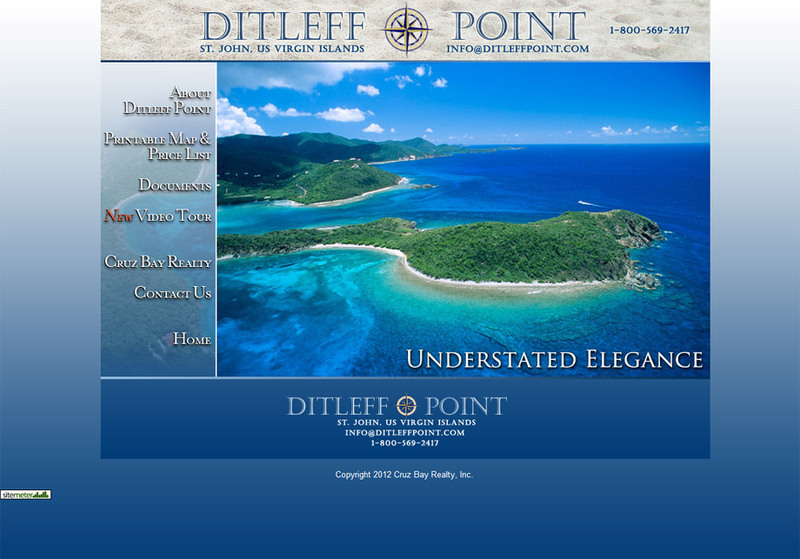 Created for Cruz Bay Realty to market their exclusive Ditleff Point listings. 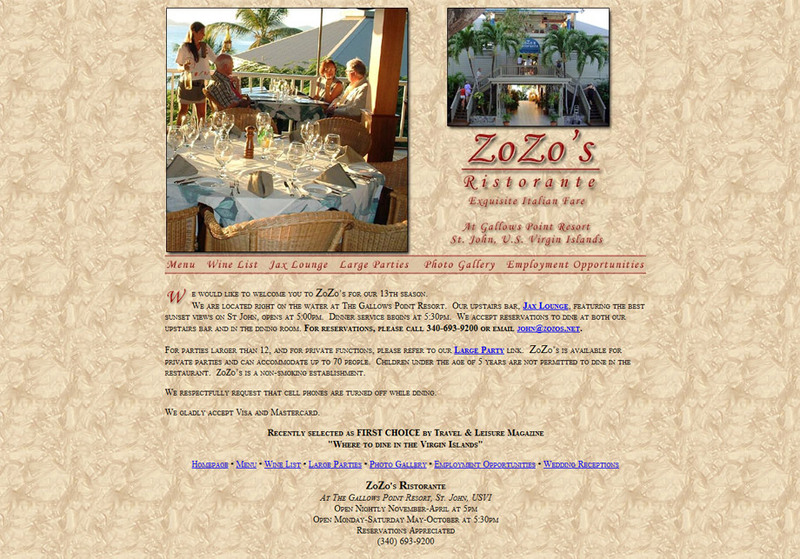 One of Cruz Bay's most popular resorts at Gallows Point, which also houses the fabulous Zozo's Ristorante. 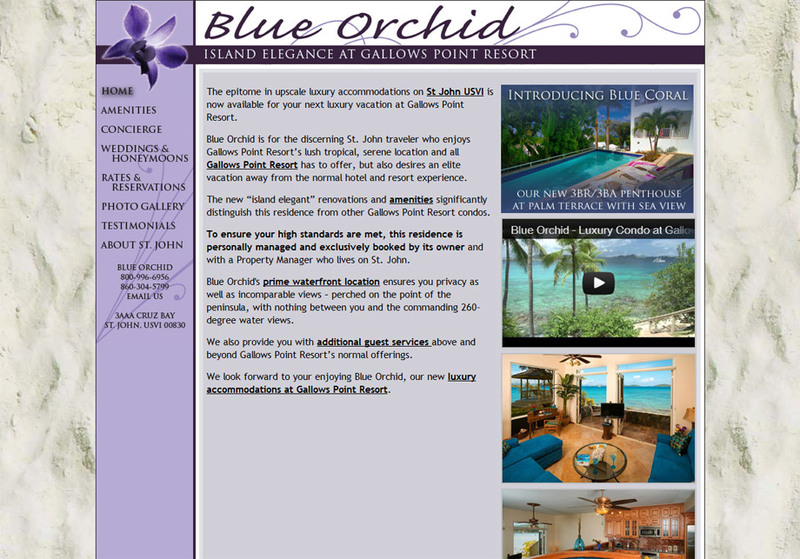 Luxury accommodation at Gallows Point Resort. Site build included a credit card billing system to receive deposit payments, which is tied in with a payment gateway for their merchant provider. Administration system also included for them to create and email invoices for payment along with receipt. 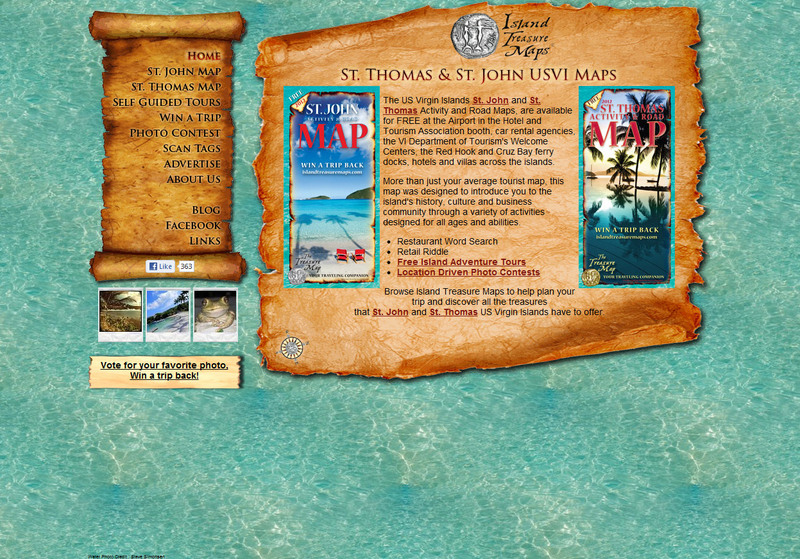 Site for Island Treasure Maps, which publishes an annual activity and road map for the islands of St. John and St. Thomas. 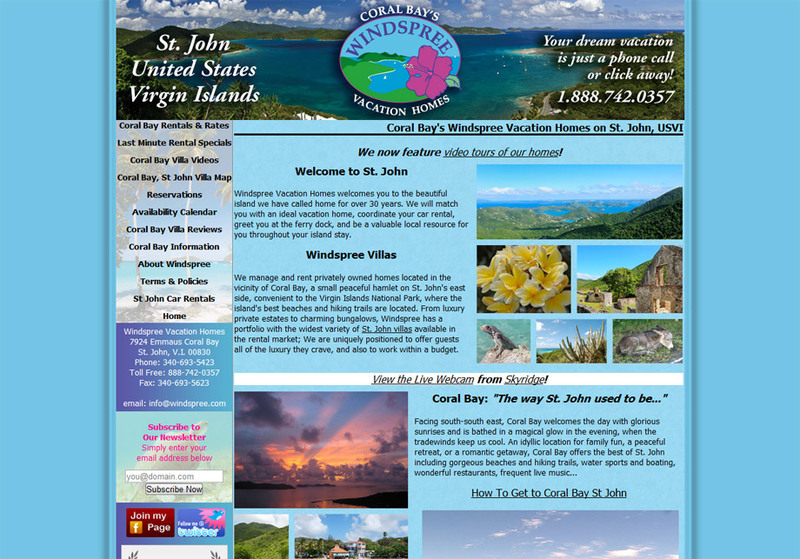 They offer an annual prize of a free trip to the Virgin Islands based upon a voting system created for the photo contest. 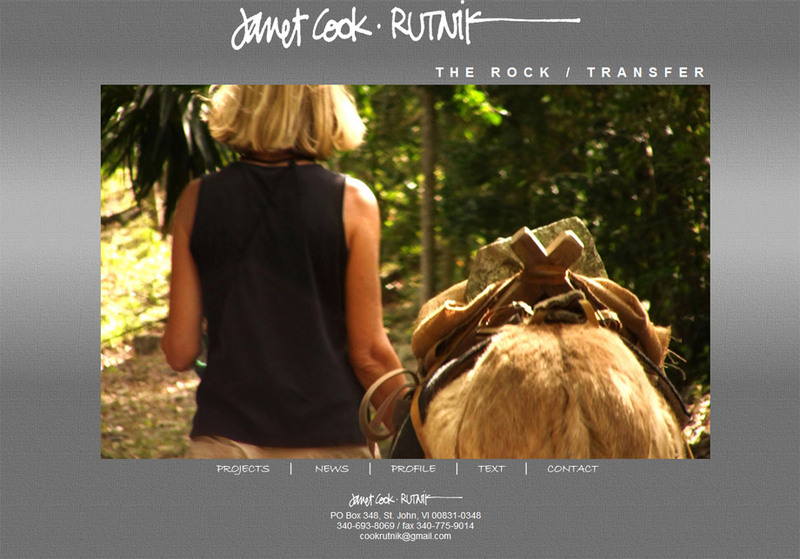 Site also includes a user registration system for the photo contest and entries. Interactive electonic maps utilizing an Ajax script which are based off of PDF images of each island's map. 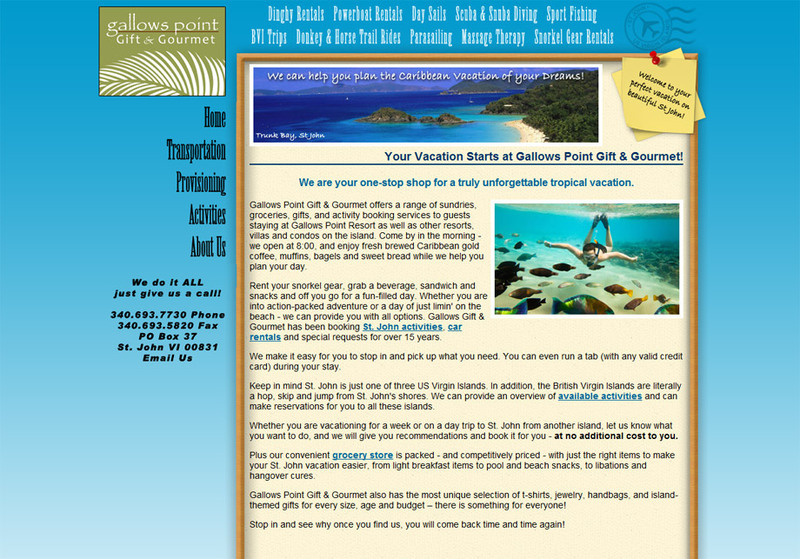 Gallows Point Gift & Gourmet is located at Gallows Point Resort, which includes a storefront for guests as well as provisioning and activites bookings. 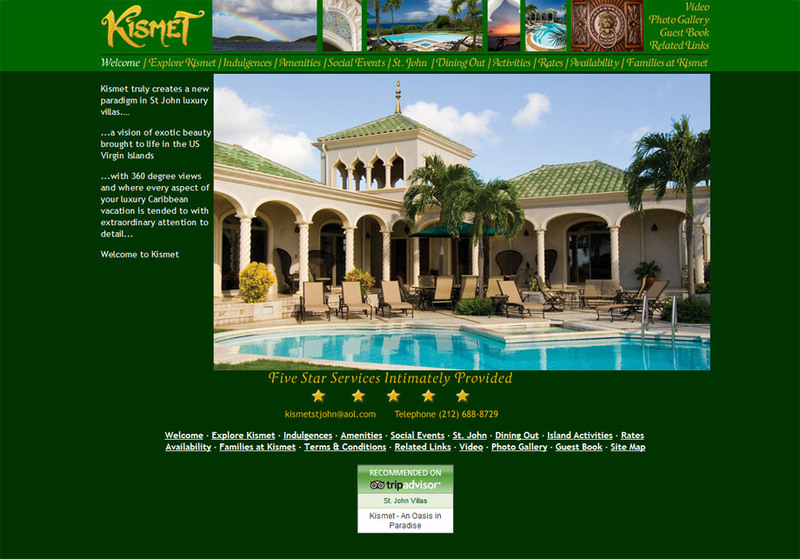 Kismet truly creates a new paradigm in St John luxury villas. Site also uses a custom availability calendar system we developed alongside its own administration system. 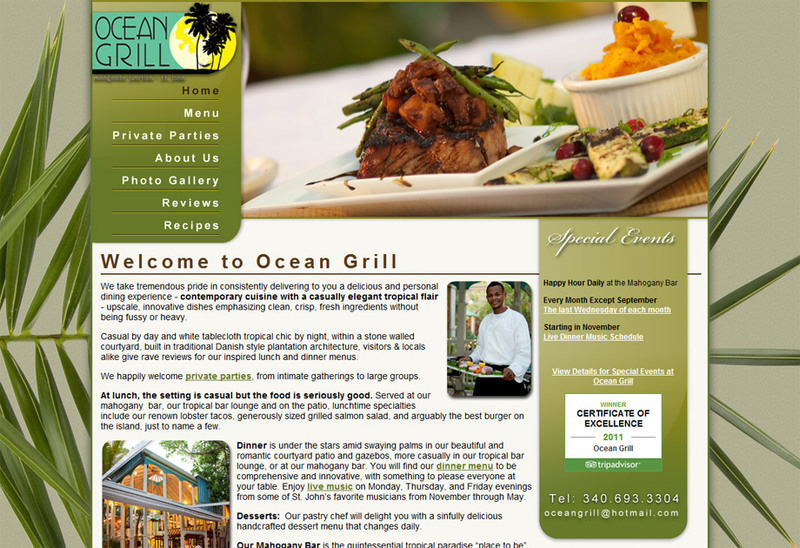 Ocean Grill at Mongoose Junction, St. John. 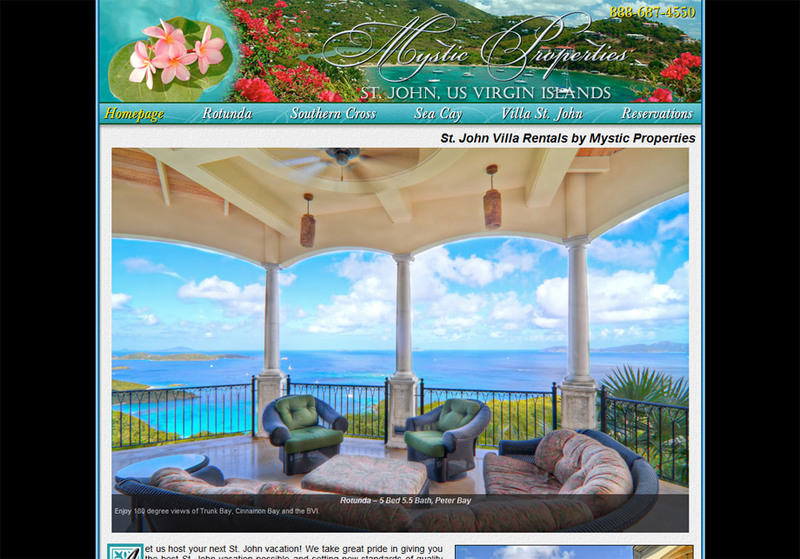 Windspree Vacation Homes manages and books dozens of villas on St. John. This site utilizes a database including its own administration system, allowing them to add or update any of their properties at any time. 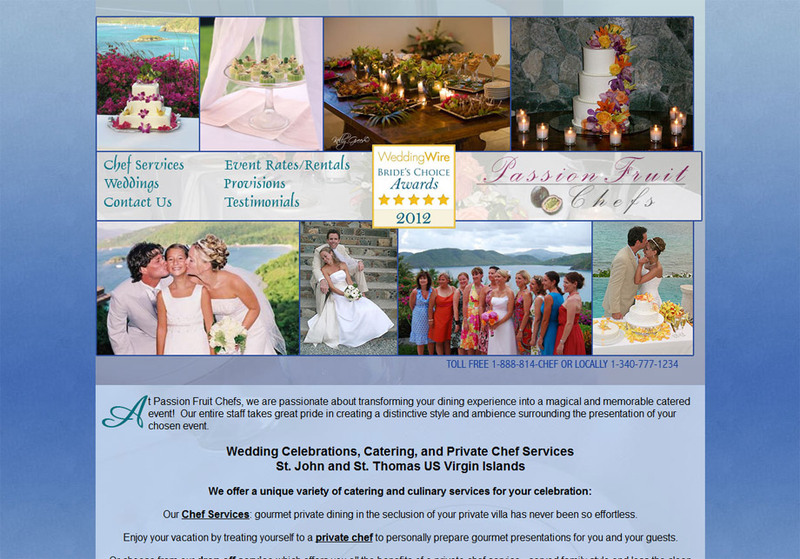 Catering company based out of St. John. Site originally built in 2006 and redesigned in 2009. 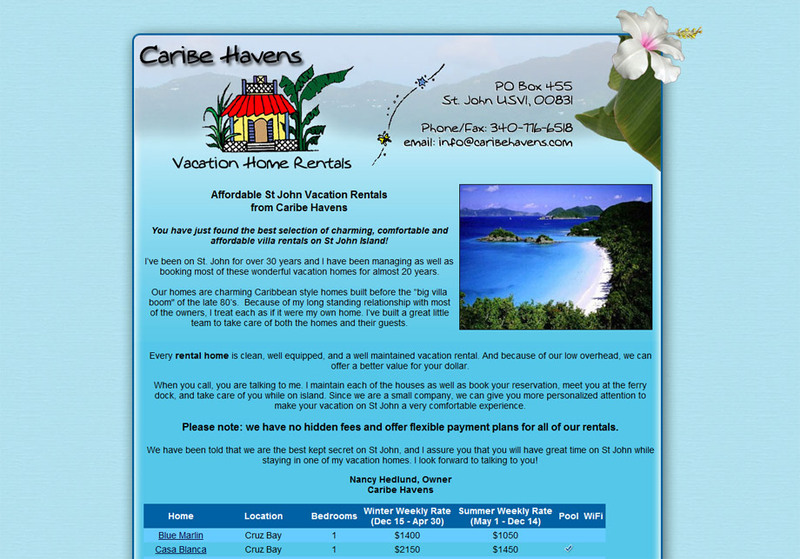 Cruz Bay vacation rental company. 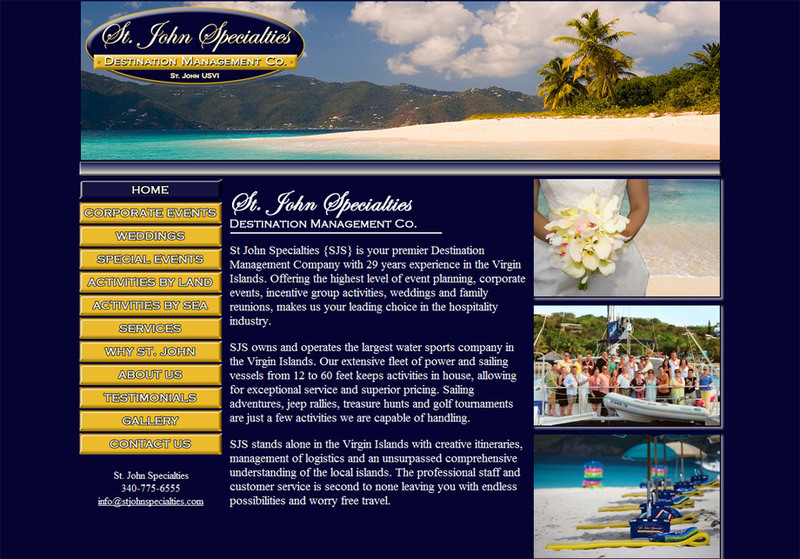 St. John villa company that features four unique vacation rentals. 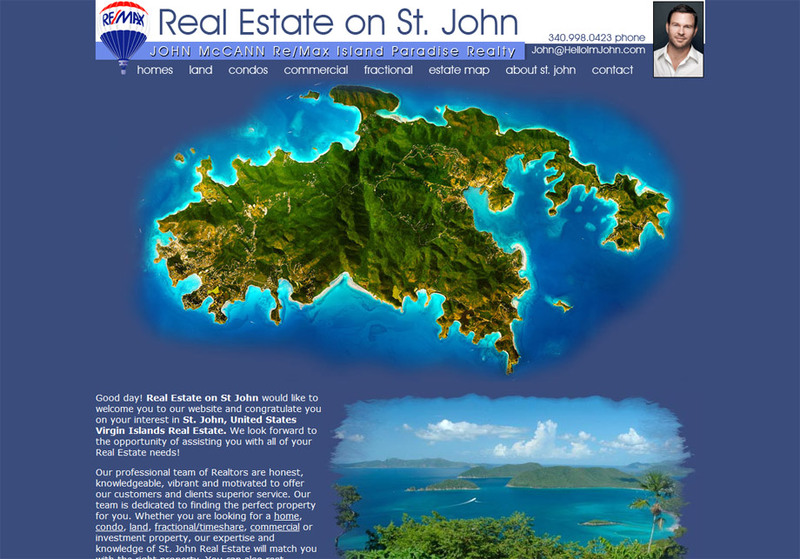 St. John rental villa in Fish Bay. 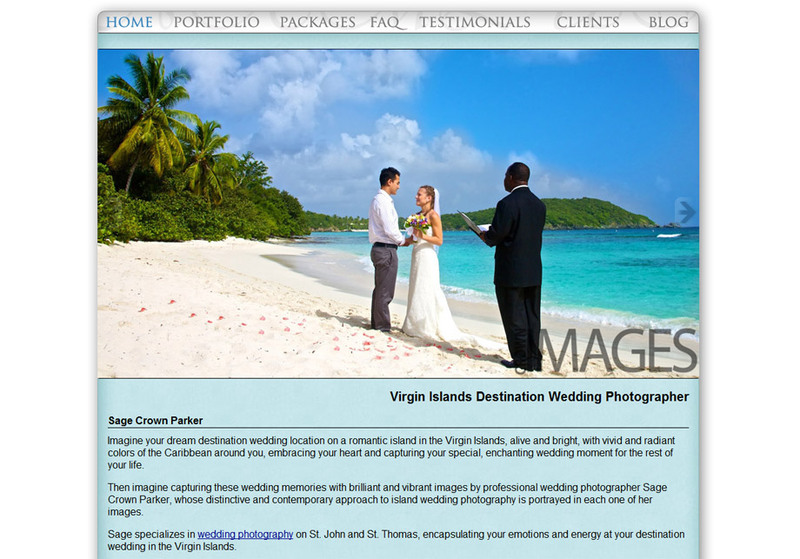 Sage specializes in wedding photography on St. John and St. Thomas. 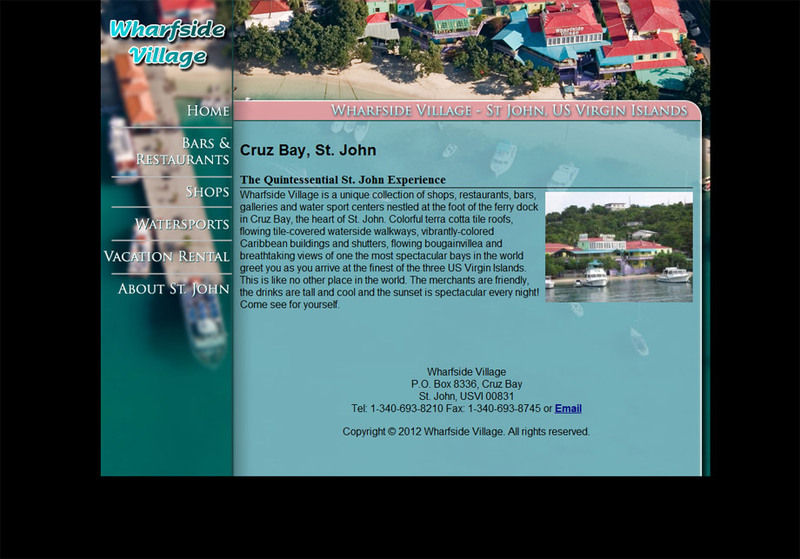 Wharfside Village is a unique collection of shops, restaurants, bars, galleries and water sport centers nestled at the foot of the ferry dock in Cruz Bay, the heart of St. John. 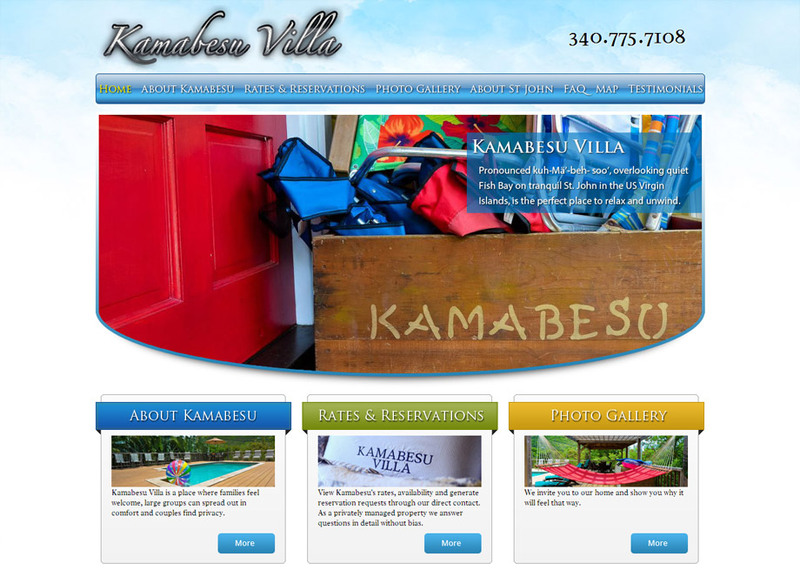 Small website for a villa rental company. 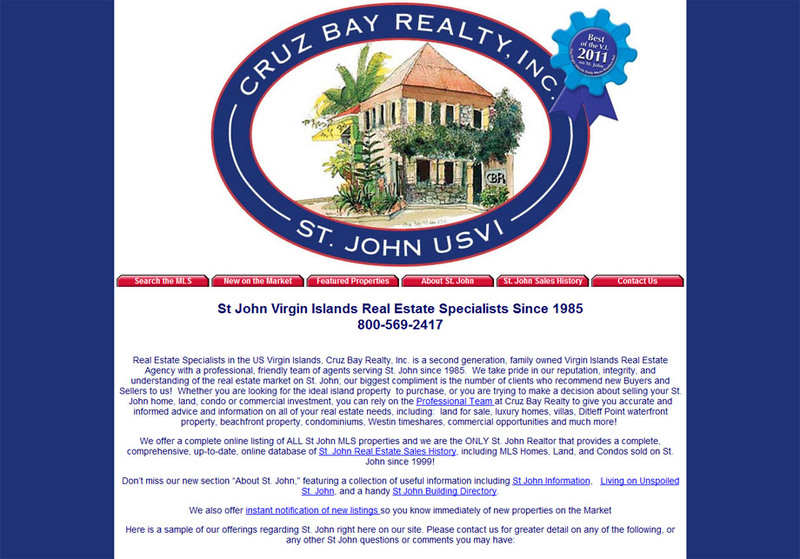 Real estate site which includes database feed using FlexMLS. 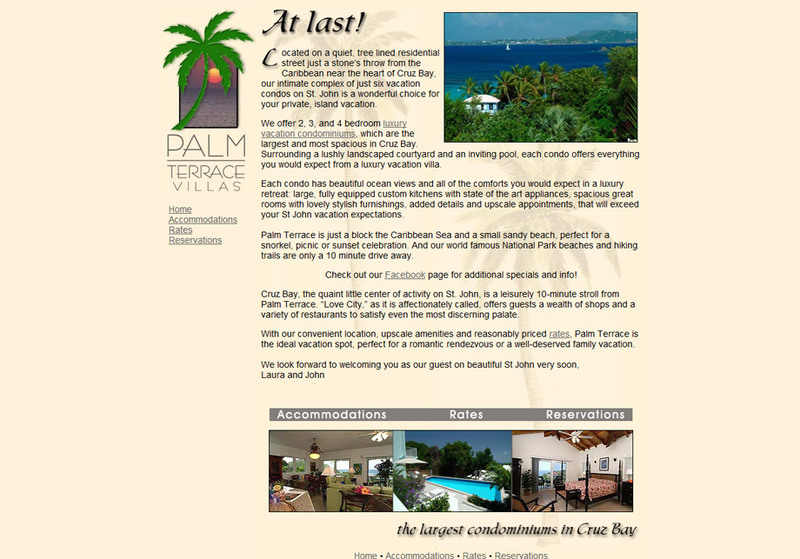 Website for Palm Terrace Villas, the largest condominiums in Cruz Bay. 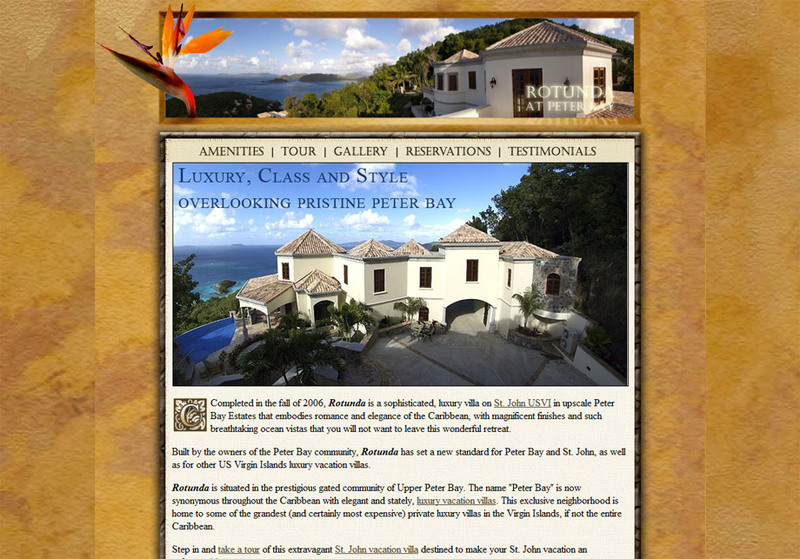 Luxurious Peter Bay villa, which includes 360 degree virtual tours which we photographed and implemented. 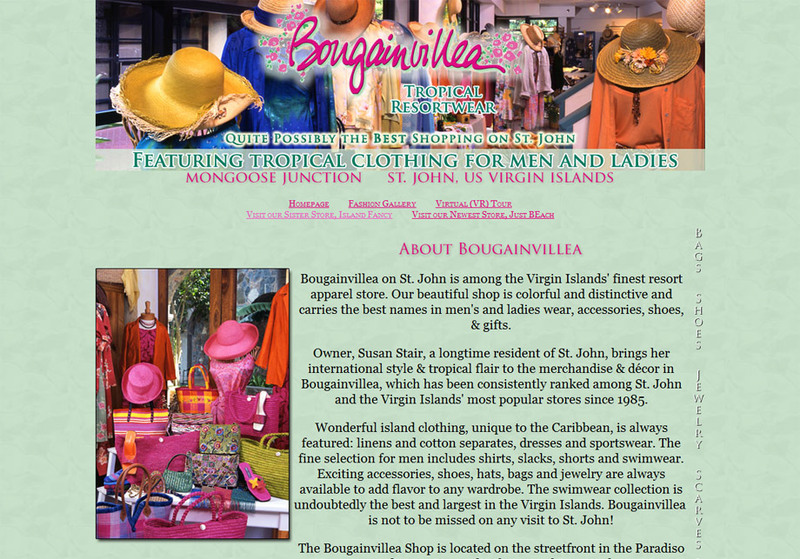 Site created for two St. John shops located in Mongoose Junction in Cruz Bay. 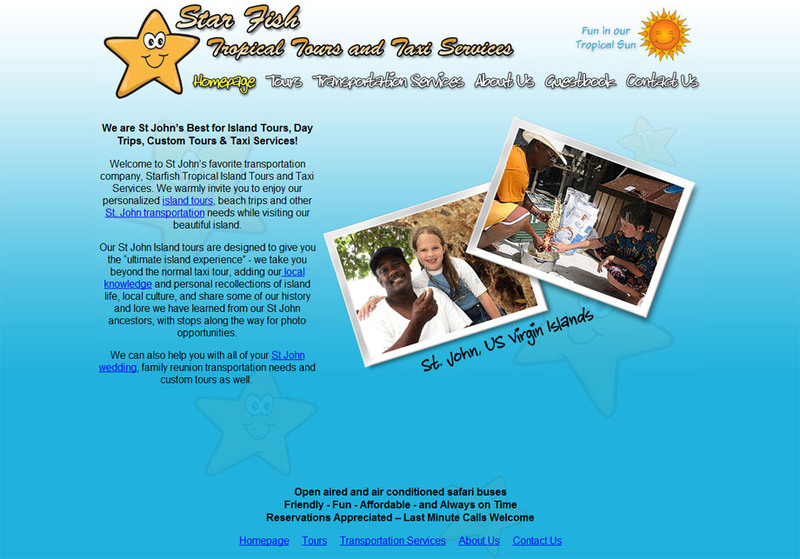 Star Fish Tropical Tours and Taxi Services offers island tours, day trips and taxi services for the island of St. John. 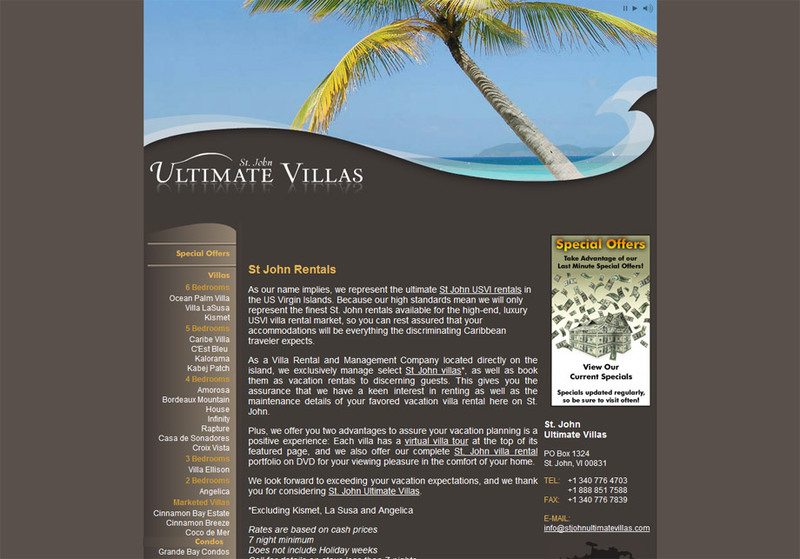 St. John Ultimate Villas offers a wide selection of luxurious rental villas. 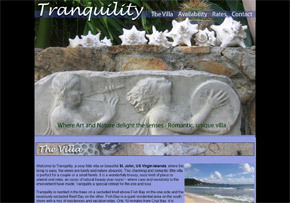 Showcase of a well-known Virgin Islands artist. 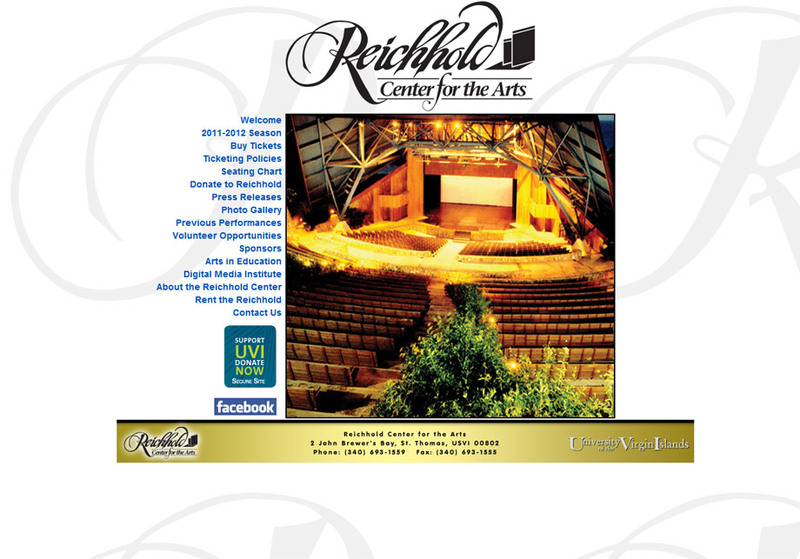 Located at the University of the Virgin Islands, the Reichhold Center for the Arts is the foremost venue in the US Virgin Islands for entertainment and has a long history of world-reknowned performers. 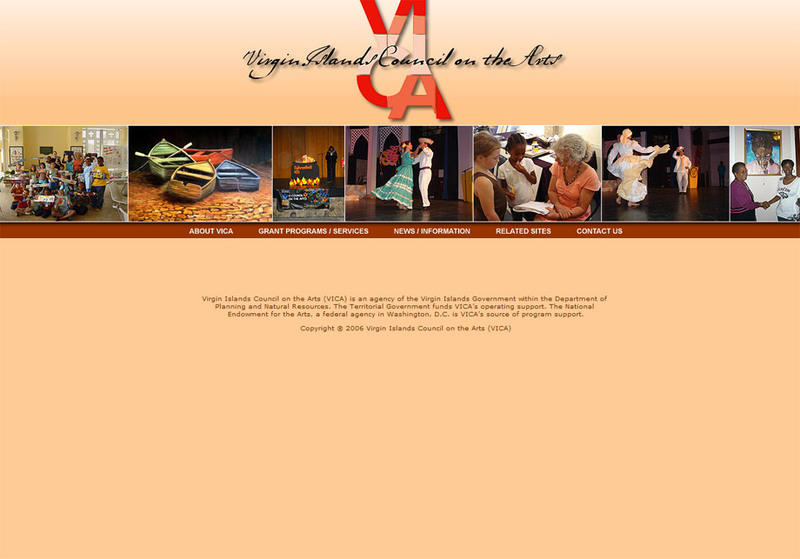 Site is updated annually for each new season. 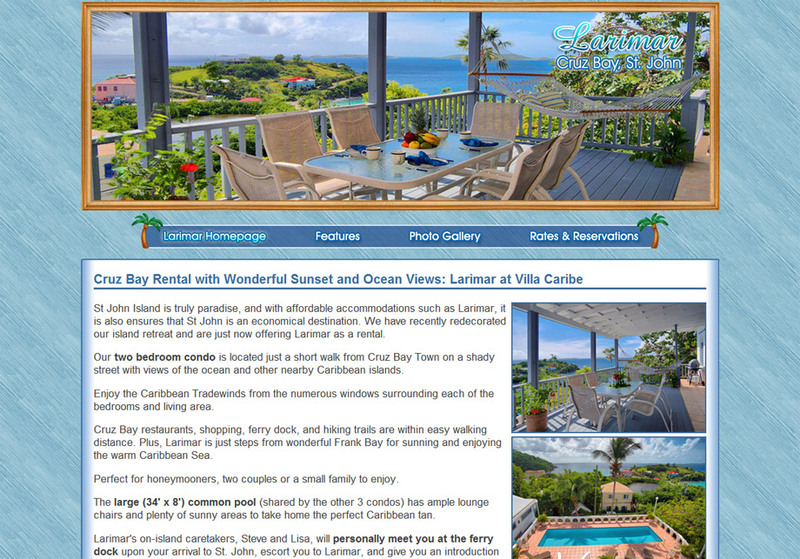 Vacation rental with a spectacular view of Coral Bay, St. John. 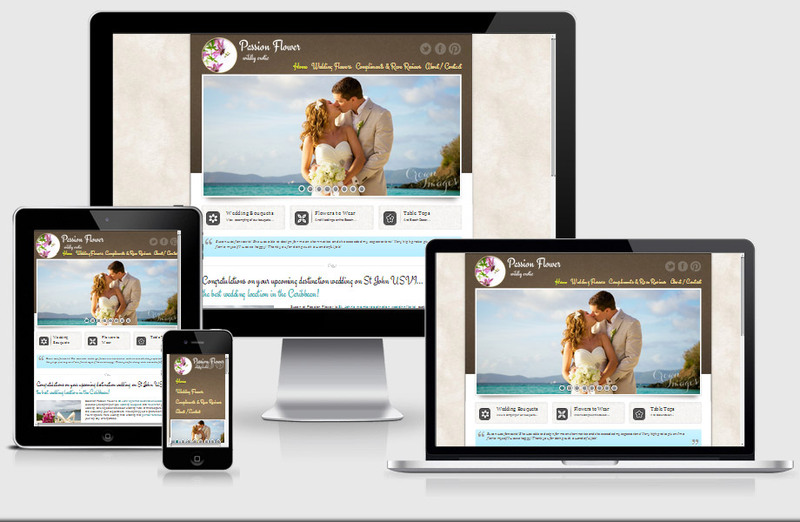 Realtor's site including FlexMLS database feed which is automatically updated daily. 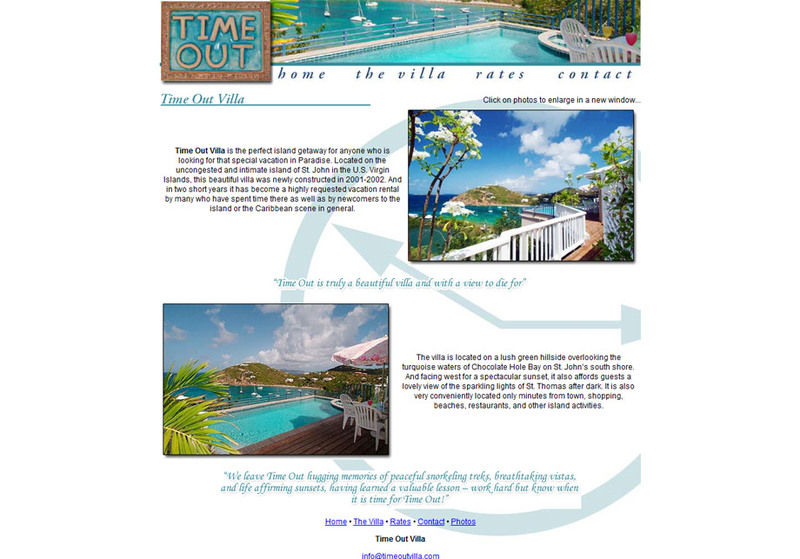 St. John rental villa located in Chocolate Hole. 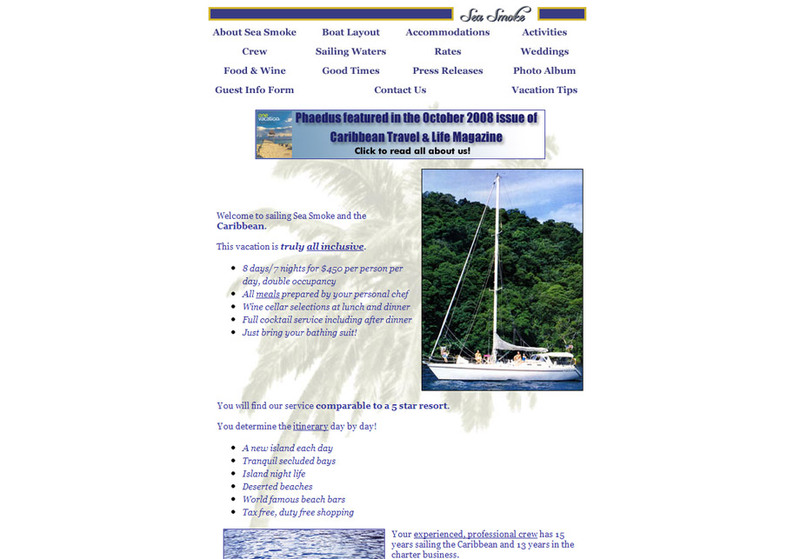 Daysail charter sailing vessel based out of St. Thomas, USVI. 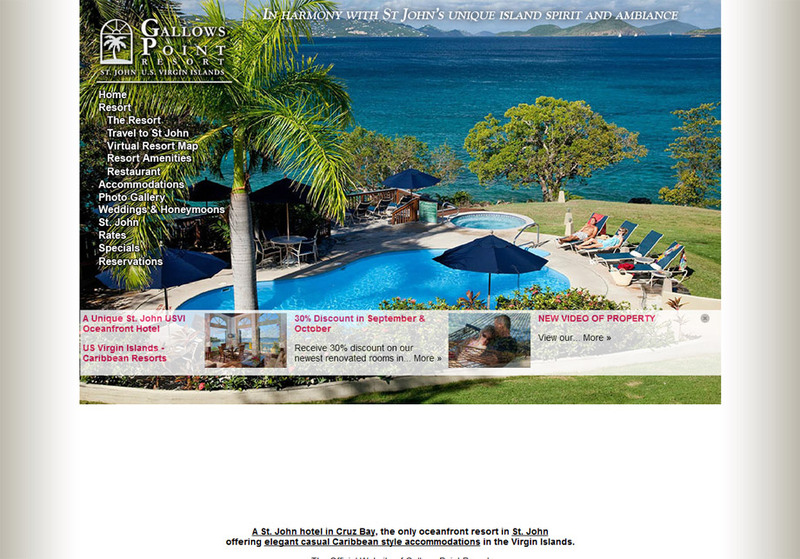 Exquisite Italian fare located at Gallows Point Resort on St. John.